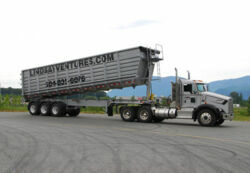 We currently have 6 roll off trucks and over 175 roll off containers. We are small enough to have that personal touch and large enough to handle your needs! Have a need for bigger bins? Check out our sister company Lindsay Ventures (2004) Inc. Questions? Would like to rent a bin? Abby Bin Services (2014) Inc.
#101 - 8030 Enterprise Dr. Copyright 2015 Abby Bin Services (2014) Inc. All Rights Reserved.